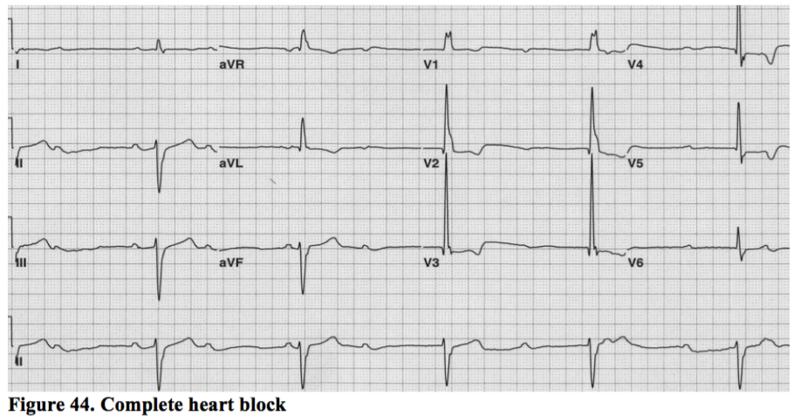 Any degree of heart block can occur in the context of an acute MI. Characteristically, this would be an inferior MI. This may resolve with treatment of the infarction and may not require long-term pacing. This has been referred to earlier, and so this chapter will concentrate on conduction disease in isolation, without coronary involvement. First degree heart block (PR interval>0.2s) is asymptomatic and minor AV nodal dysfunction. It can be caused or exacerbated by drugs. It does not cause symptoms. Wenkebach phenomenon (progressive lengthening of the PR interval until a beat is dropped) is usually vagally mediated and not usually dangerous. It rarely requires permanent pacing (only if significant, disabling, symptoms occur) and is frequently seen in athletes with high vagal tone. If an 80-yr old man has Wenkebach, however, that is likely a marker of underlying conduction disease. 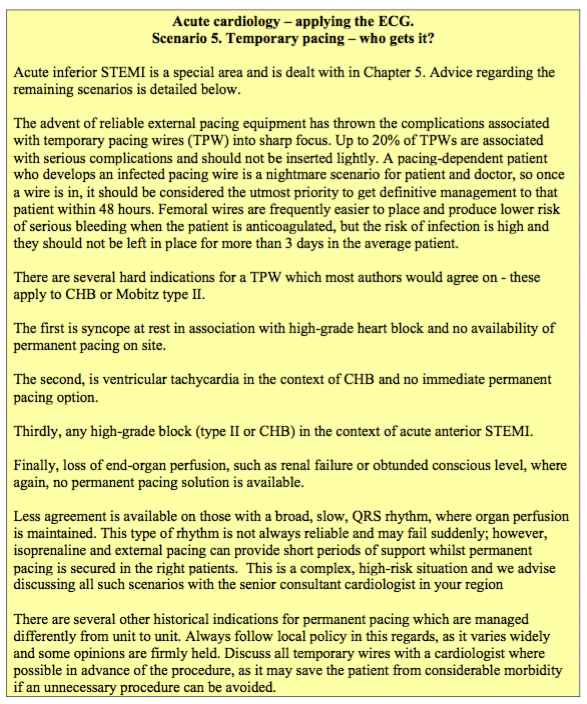 Mobitz type II heart block is more significant, and heralds complete failure of the normal conduction system. It represents intermittent failure of the AV node to conduct and usually occurs at a set ratio of beats – for example every third beat. It is a strong indication for permanent pacing in symptomatic subjects and should be discussed immediately with a cardiologist, whether symptomatic or not, regarding consideration of permanent pacing. This condition may present as syncope and has associated skeletal morbidity in the elderly should it recur. Any AV nodal blocking drugs must be stopped immediately. This represents total failure of the AV node to conduct from the atria to the ventricles. Thankfully, the His-Purkinje system has the capability to initiate depolarisation and maintain output in these circumstances, otherwise sudden death would occur. However, nature has designed this automaticity to conduct at a slow rate, to avoid competing with the much more efficient SA node above it. These ‘escape rhythms’ are also less reliable than normal conduction and have a 1-year mortality of about 50% without pacing. The order of automatic depolarisation of the heart is: SA node: automatic rate approx 70bpm. AV node: automatic rate approx 50 bpm. His bundles: approx 40bpm. Distal conduction fibres: approx 30bpm. The slower the escape rate, the more distal the initiating fibres are likely to be within the conduction tissue. Some argue that the more distal the escape is, and therefore the broader the QRS is, the more unreliable this fallback rhythm will be. Due to the risk of syncope, with skeletal injury and sudden death, these patients should be managed urgently by the local cardiology team. In the interim, the patient should be admitted to a monitored bed, with a minimum of external pacing pads available and the skills to use them available at all times.